Hallyu star Jang Geun Suk donated a total of $41,178 to the Miral Welfare Foundation. These funds were used to provide surgery for 10 handicapped teenagers. Jang Geun Suk joined the charity fundraiser along with bag brand Linoui. He donated about 200 personal items. 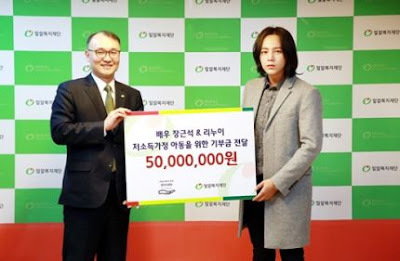 Jang Geun Suk shared, "I thought carefully about where to donate the funds as it was put together by the love of many people. I am happy that I can donate in a meaningful way, and I hope the teens will get a chance at a healthier life." Thanks to Jang Geun Suk 10 teens are looking forward to a brighter future. Jang Keun Suk is a great person and very kind.